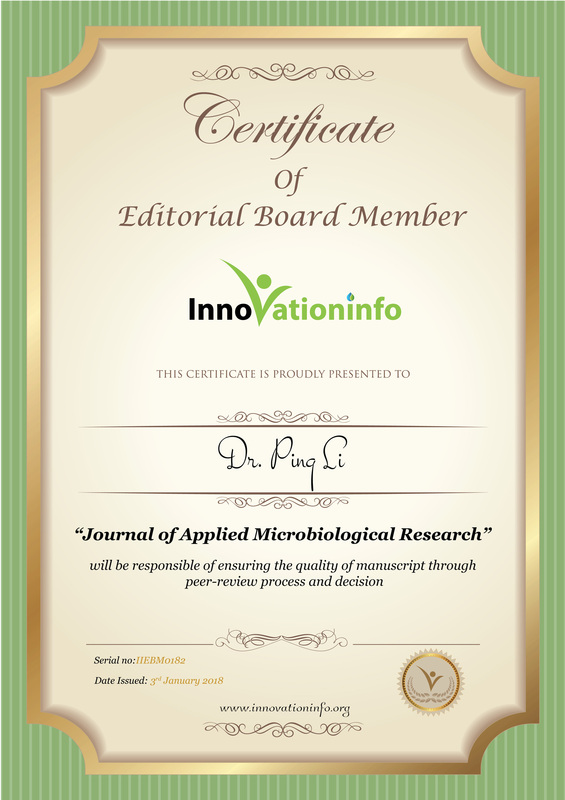 Research Interest: Food microorganism derived bioactive substances: main focus on probiotics, especially the lactic acid bacteria, that could produce bacteriocins, vitamins and extracellular polysaccharide etc, and also their application in food industry; The mode of action of bacteriocins; Regulation of probiotics and prebiotics to gastrointestinal (GI) microbiota. Biography: Ping Li is currently working as a Professor in College of Food Science and Biotechnology at Zhejiang Gongshang University, China. She completed her Ph.D. in the department of Microbiology at Zhejiang University, China. she worked as a postdoctoral associate at Florida State University, USA during the year 2009 to 2014.
for proper SPB separation during meiosis I in budding yeast. J Cell Biol. 2015, 209(2):247-59. Zhejiang Univ Sci B. 2016, 17(8):569-79.
? Major in Microbiology, Ph.D.
probiotic strain producing B-group vitamins. J Biotechnol. 2016, 234:66-70.
strain producing bacteriocins and B-group vitamin riboflavin. J Biotechnol. 2016, 229:1-2. Sequencing and Evolutionary Analysis of Marine Gut Fungus Aspergillus sp. Z5 from Ligia oceanica. Evol Bioinform. 2016, 12(Suppl 1):1-4. Lactobacillus reuteri. Int J Food Microbiol. 2015, 206:56-9.
budding yeast, Mol Biol Cell. 2014, 25(19):2934-47. Heterologous Non-collagenous Protein. Protein Pept Lett, 2009,16(3):306-311.
cysteine. Biochem Biophys Res Commun. 2008, 374:399- 404. Li P, Wu X. Molecular Mechanisms of Resistance to TRAIL-induced Apoptosis in Tumor. Chinese J Cell Biol, 2006, 28:153-159 (in Chinese) . and Technology. 2009, 25(3):288-293 (in Chinese). fermentation performance, Bioresour Technol. 2011, 102(3): 3020-3027.